A traditional tostada, a crispy corn shell topped with refried bean, lettuce, tomatoes, cheese and guacamole, but with the addition of a Cafe Rio style sweet pork, it’s anything but ordinary. There’s a local fast food Mexican restaurant in Utah that’s super popular. Everything is made to order, the portions are huge, and the food is fresh and addicting. We love Cafe Rio sweet pork; my husband especially. When I suggest going out to eat, Café Rio is the first place he suggests. We nearly always order a Sweet Pork Salad and split it. Their salads are huge! If I’m at Café Rio by myself, I’ll order a tostada instead. It’s about half the size of the salad, but still huge by tostada standards. My copycat toastadas are smaller, so plan on serving two per person. An Instant Pot is one of the most popular brands of electric pressure cookers. They are easy to use and your Instant Pot can help you create these delicious Café Rio Sweet Pork Tostadas! 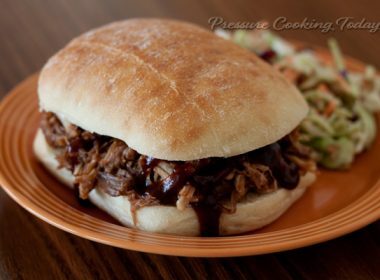 Most Café Rio sweet pork recipes require cooking for 6-8 hours in the slow cooker. 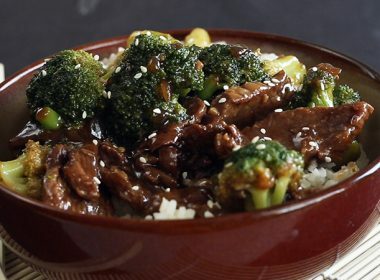 In the pressure cooker, you can get your Café Rio sweet pork fix in about an hour, without waiting in the Café Rio line, and for a fraction of the cost. Add chiles, 1 cup Coke, chunky salsa, brown sugar, tomato paste, chili powder, and cumin to the pressure cooking pot; stir to combine. Add the pork to the pressure cooking pot. Select High Pressure and set the timer for 25 minutes. When beep sounds, turn off pressure cooker and let the pressure release naturally for 10 minutes. After 10 minutes, release any remaining pressure. When valve drops carefully remove lid. Pour the meat into a colander to drain juices. Shredded the pork and put it back in the pressure cooking pot. Add remaining 1 cup Coke and enchilada sauce and stir to combine. Heat on saute setting until heated through. Preheat oven to 350°. Lightly spray tortillas with cooking spray. Bake until tortillas are crisp and starting to brown, about 5 minutes. 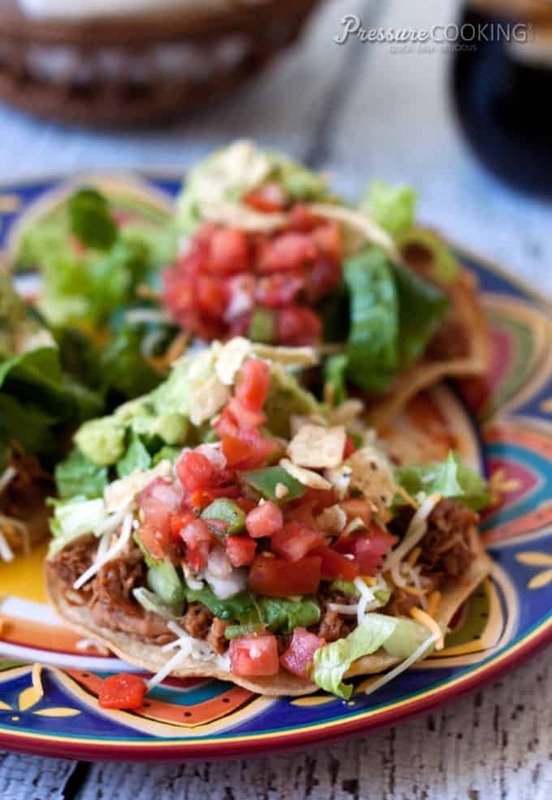 Spread tortillas with refried beans, top with sweet pork, shredded lettuce, cheese, guacamole and salsa. This is going on the “Gotta Do” list. My Bride and both love Café Rio’s Pork Tostadas but it seams that our Café Rio gets carried away with the lettuce. Now we can pile on the pork and cut back on the lettuce. Great! My husband’s all about the pork too. Does the meet shred when it is cut up in chunks? If I use a 2.5 pound pork tenderloin how long would I pressure cook it? 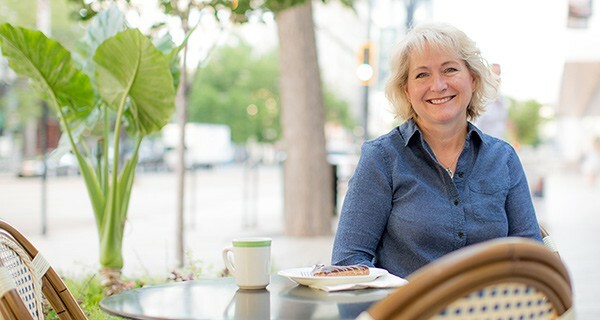 Hi Heather – yes, the meat will shred when it’s cut up in chunks – it just cooks much faster when it’s cut in piece. A pork loin will work but it won’t be as succulent. If I leave the pork whole (so don’t cut it into one inch cubes) would I have to adjust the cooking time? Hi Becca – yes, the thicker the piece of meat, the longer you’ll need to pressure cook it. It will probably take at least 90 minutes for a 4 lb. pork shoulder to be shreddable. Enjoy! Could I use bone-in country pork ribs instead of the shoulder? Would I adjust the time? I have 6qt Power Cooker XL and LOVE it- and your website! Thanks Marla – that’s so nice to hear. I did try bone-in country pork ribs for pulled pork once and wasn’t very happy with the results. 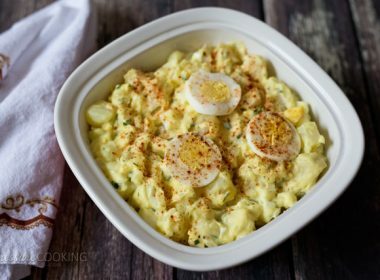 How about this recipe instead? http://www.pressurecookingtoday.com/sweet-and-sour-country-style-ribs/ If you do decide to try this recipe with the ribs, I wouldn’t change the cook time. What would you recommend for a stovetop pressure cooker? Hi Melinda – I would use the same cook time for a stove top pressure cooker. Enjoy! We have a Café Rio down the street here in Irvine, CA & their Barbacoa Pork is my favorite too. I’m going to make up this recipe & make sure to have some leftovers. 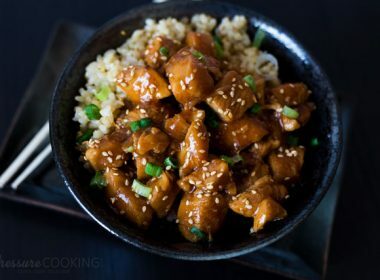 What size pressure cooker does this recipe use? 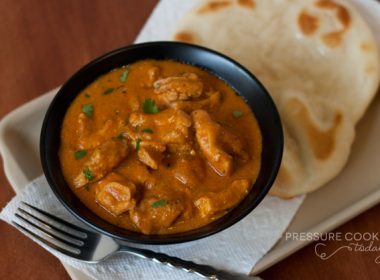 Hi Karla – here’s a link to the pressure cookers I use http://www.pressurecookingtoday.com/faq/ both 6 qt. 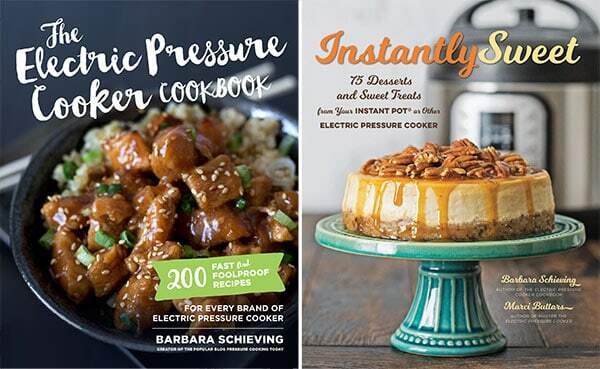 electric pressure cookers. The Mexican food lover in me is certainly aroused. Wow, this looks so flavor. Another Barbara hit again! When you say to put the pork back into the crockpot with the coke and enchilada sauce do you pressurize it again or just warm it on the stove? Hi Brenda – yes, you put it back in the pressure cooking pot, stir it to combine and heat it on the saute setting for a few minutes. 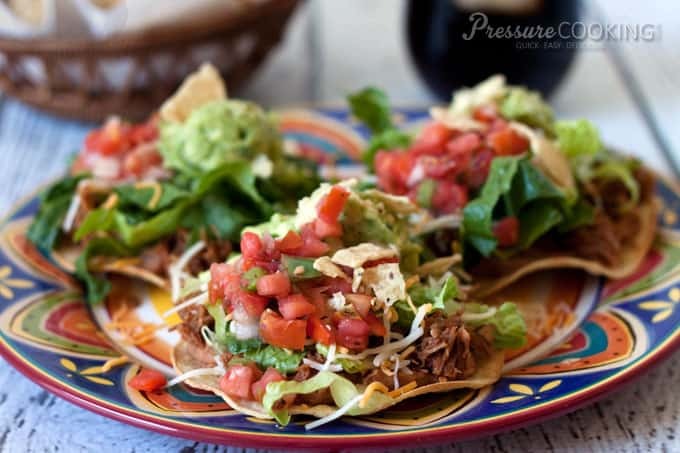 We don’t have Cafe Rio here but those Pork Tostadas sure do look good….I know we’d love these. I’ve yet to try making a pork shoulder in either the crock pot OR the pressure cooker. This recipe may be the one to springboard me into action. I’ll have to check out the price of them at the grocery store this weekend.